Good Day All! Rise and shine!! First, how about some new pics of Julianne Hough at the Daily Mail. She looks so cute as she attended a Taylor Swift concert the other night. Derek Hough did so as well. You can view some new shots of him at Pure Derek Hough. And for those wondering, Kaitlyn Bristowe will not be dancing in the new season of Dancing With The Stars. It’s not the right time. You can read more at E Online. Allison Braver will not be dancing in this season either according to this tweet. Dang, she would have been a good one. Also, US Weekly has a fun article about Nick Carter and some of the Backstreet Boys costumes he should recycle for Dancing With The Stars. *Awww, memories. Bring it, Nick! I can’t wait to see how he and Sharna will get creative in this area. Lastly, Andy Grammer was on Jimmy Kimmel Live last night. He sang and he got his groove on. Peta has a good one this season…. DWTS Season 21 Rumor: What An Interesting Follow By Allison Baver!! Thanks to Carrie Wiscombe via DWTS360 for this interesting news. 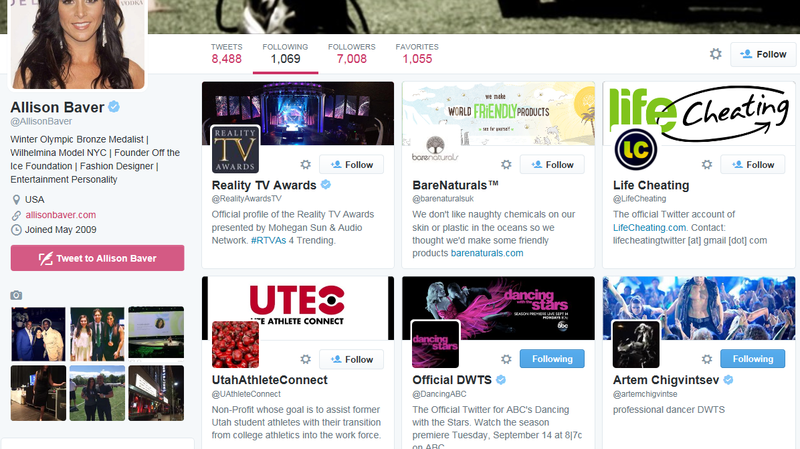 Check out how Allison Baver is following the Dancing With The Stars twitter account and Artem Chigvinstev. Could this be his new partner?